Eva Ulery, DVM, clinical instructor, works with fourth-year veterinary students Brett Sexton and Brittany Hofman to take radiographs of Lady Blue’s jaw. Lois Hoover of Kansas City has rescued many dogs of a variety of breeds over the years, but Italian greyhounds hold a special place in her heart. “They’re tiny and fragile, but so strong in spirit,” she said. Hoover is a foster parent for the Missouri/Kansas chapter of the Italian Greyhound Rescue Foundation. “Spirited” is how Hoover describes “Lady Blue,” the Italian greyhound she began fostering in January. Lady Blue and her sister were surrendered to the rescue organization by someone who could no longer care for them. Hoover took in Lady Blue while her sister was sent to another foster home in St. Louis. The foster families will care for the dogs until as many medical needs as possible have been met. For Lady Blue, who is believed to be about 9 years old, that has meant extensive veterinary intervention to correct severe dental problems. 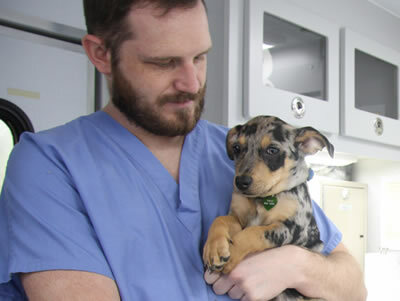 Hoover first took Lady Blue to her veterinarian in Kansas City, who referred the dog to the University of Missouri Veterinary Health Center (VHC) Small Animal Hospital. 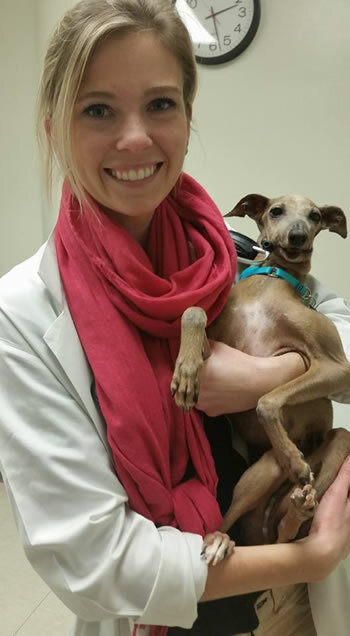 Eva Ulery, DVM, clinical instructor of community practice, determined the dog had end-stage periodontal disease. Unfortunately, there was not enough healthy gingiva and bone left to repair her mandible. Ulery removed the unhealthy bone, gingiva and teeth, and sutured the remaining tissue to create a functional lower jaw. Now, Lady Blue is infection-free and eating comfortably. Watch for symptoms of dental disease. Pets often show no symptoms of periodontal disease. Signs of dental problems can include reluctance to chew, especially on hard toys or food, using only one side of the mouth, excessive drooling and bad breath. If pets have an odor to their breath, bacteria could be growing underneath the gum surface. 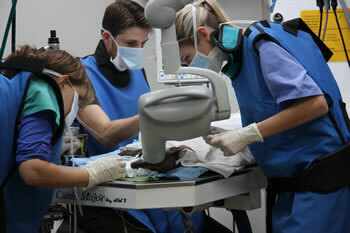 Have pets’ teeth cleaned regularly by a veterinarian. “Many pets need their teeth professionally cleaned each year,” Ulery said. Ask your veterinarian for a complete oral exam and radiographs as well. Consider products designed to help prevent dental disease. Examples include food, water additives and specially-designed chew toys. Ulery suggests asking your veterinarian for advice or checking for dental products on the Veterinary Oral Health Council website, http://vohc.org.